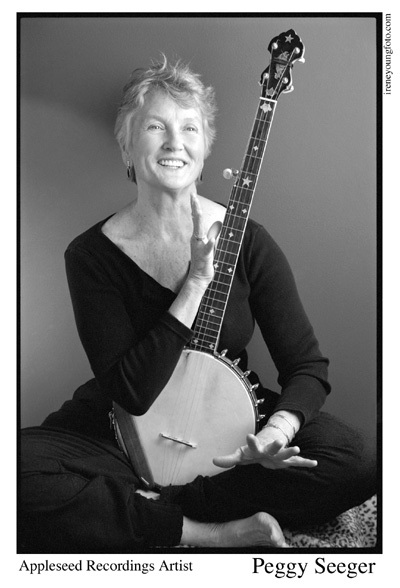 [Words and music Peggy Seeger: PERIOD PIECES, Tradition (Ryko) TCD 1078. 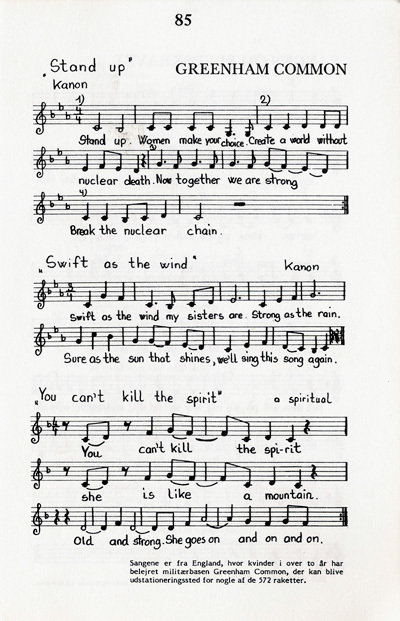 Se also: Reclaim the Night, Tomorrow and hear Woman on Wheeels sung by Peggy Seeger. 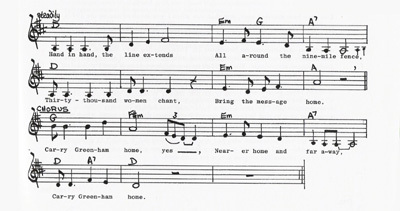 Sung at the December 12, 1982 demonstration - the biggest women demonstration ever. Editorial: Peril of the peace demo. 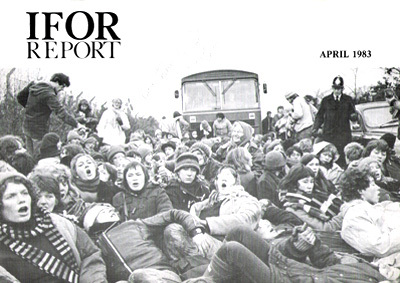 In: Daily Express, 12/13/1982. Editorial: The Sun says : War and peace. In: The Sun, 12/13/1982. THE YEAR-LONG campaign against nuclear weapons reached its climax yesterday when thousands of women linked arms around Greenham Common base. It was an impressive spectacle. The power of conscience and morality is always impressive in a free society. Yet, as they huddled in the rain and wind to assert their democratic rights, did any of these women think of a country which also marked an anniversary yesterday? It is exactly a year since the Communist dictators of Poland smashed Solidarity and imposed martial law. Do the ladies from Cheltenham and Liverpool and Glasgow know just what that means? IT MEANS that people can be arrested and detained ndefinitely without reason or trial. IT MEANS they are forbidden to join anything from a trade union to a sewing circle. There are no marches in Poland. No demonstrations outside Russian military bases. 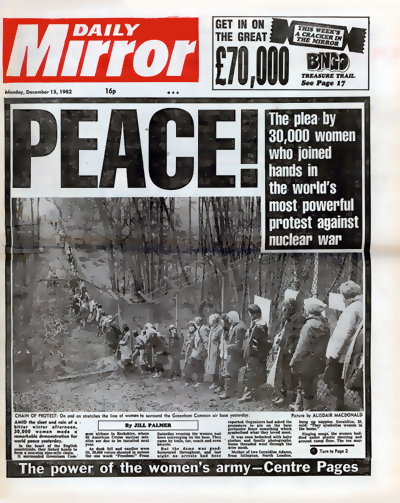 The women of Greenham Common are not alone in detesting the waste and menace of nuclear weapons. But in a perilous world these engines of destruction happen to be the sole guarantor of our freedom. They mark the difference between peaceful protest on an ordinary Sunday in Britain and life without hope in the prison house that is Poland'. Edwards, John: Maby this marked the start of women taking over the world. In: Daily Mail, 12/13/1982. Mum's army. In: Daily Star, 12/13/1982. Palmer, Jill: Peace. In: Daily Mirror, 12/13/1982. The peace war. In: Daily Express, 12/13/1982. Saunders, Kieron: 30.000 women join in nuke base blokade. In: The Sun, 12/13/1982. Whittow, Hugh: Give Peace a chance. In: Daily Star, 12/13/1982. The women of protest. In: Daily Mail, 12/13/1982.